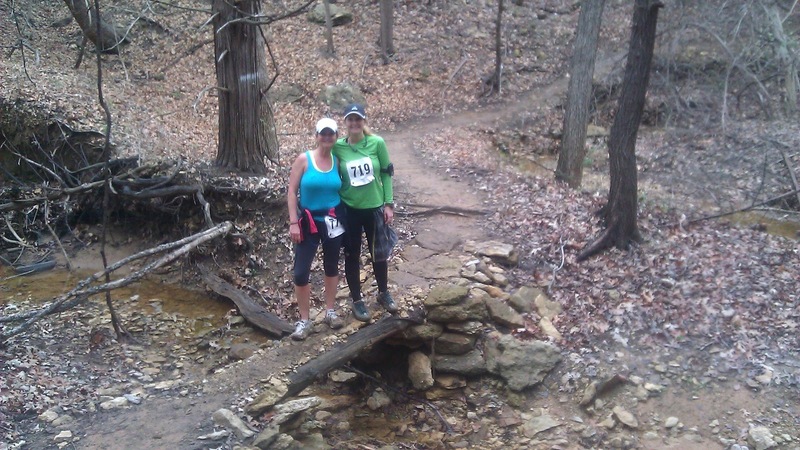 Another Cross Timbers Trail Marathon finish is in the bag! Although this one was nothing like last year. With a forecast of temperatures in the 40's and 70% chance of rain all day long, I knew this would probably be a long day. There was a group of 7 of us driving to Lake Texoma the morning of the race. Nancy offered to drive and pick me up in Norman as she was driving through. My friend Kim, who is usually a road runner but does like to run on trails every now and then, decided at the last minute (Friday night!) to run Cross Timbers and was riding down with Nancy, Janice and I. I had packed my bag the night before with towels, warm dry clothes, plenty of plastic bags to put muddy clothes in and my compression socks to wear on the drive home. My alarm went off at 2:45 am (ouch!) and I quickly got dressed, made some oatmeal and filled my race bottles. Kim had been planning on running the half marathon but decided on the drive down to just run the full marathon. No big deal, right? Except she has never ran more than 16 miles and that was over a year ago! She was pretty prepared in her current training for a half, but a full would be uncharted territory for her and she was a little nervous. The drive down went quick and the weather was pretty nice at the start. No wind, only a slight drizzle and humid temps hovering close to 50 degrees. We picked up our packets and got ready to run. 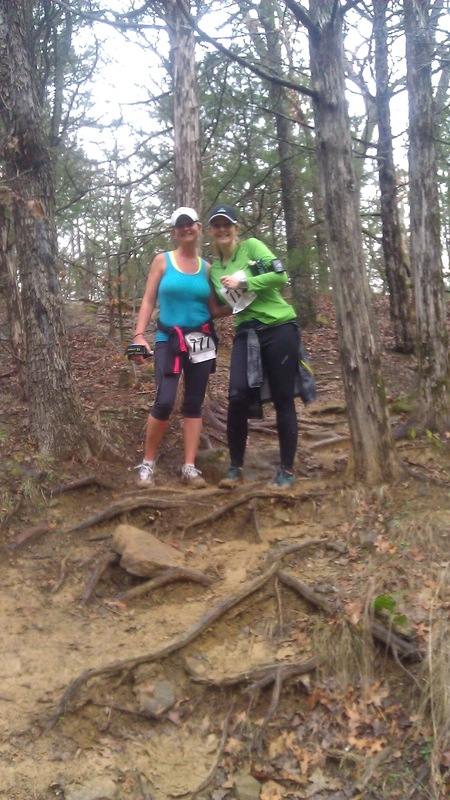 The race began with a short loop on the pavement to spread the runners out and then we jumped onto the singletrack. It was apparent about 20 seconds after we got on the singletrack that the area had been getting a lot of rain. The very first downhill had everyone slipping and sliding and grabbing for tree branches to steady themselves. Yikes, here we go! The mud there isn't ordinary, plain ole mud. It's heavy clay. And in areas it felt more like an ice skating rink! Fun, but scary in spots because there are also cliffs, rocks, roots and plenty of hills and it required constant attention and going a lot slower than normal. A few miles into the race, the rain picked up and would continue the rest of the day. It got heavier as the day went on but we didn't feel it too much as the trees blocked it. You could certainly tell by running on the trail though. 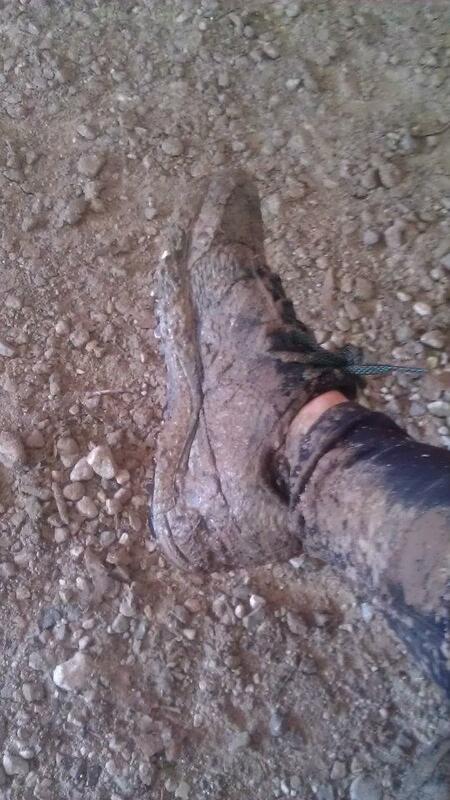 The puddles got deeper and the mud got thicker. Kim and I ran it all together and went through every phase and emotion you can go through. 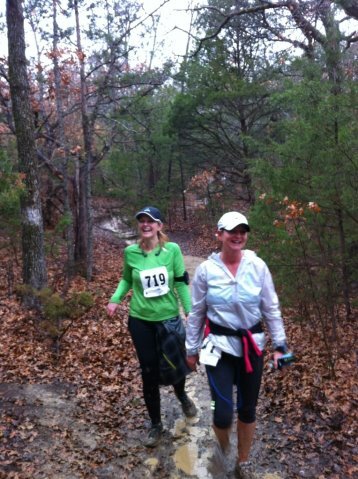 Excitement, confidence, doubt, fear, hysterical laughter, fatigue, silliness...I really can't even be bummed about our slow finish time because we had so much fun and the mud just made running fast impossible. So we made the best of it! Once we came out of the Stairway to Heaven aid station the trail leveled out tremendously and we were running on an old road and some much tamer dirt trails. One of my favorite parts of this race is at about mile 9 when you hit a new blacktop road that leads to a big wide open section right next to the lake. Very pretty and a great change of scenery. Then you tuck back into the woods briefly, then run along the beach for a minute. The turn around aid station is pretty awesome as well. Laurie had truffles! I think I ate three...SOO GOOD! You start seeing the signs about 1/2 mile before you get her aid station and they are all Irish sayings which we loved reading. The aid station is even decorated for St. Patricks Day, love it! We began the return trip with bellies full of truffles, chips, pretzels and coke. 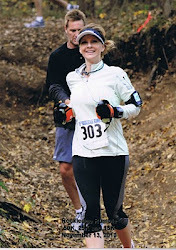 We kept up a good pace after leaving Laurie's aid station until we hit the paved road. The rain was getting heavier and we started to feel wet and cold. It was a little worrisome to see how much the trail was changing as the day went on and the rain picked up. 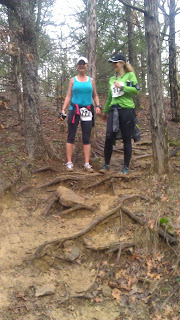 As long as the trail was flat we could run, but slowly. On the hillier sections we were hardly making any progress at all. We'd try to run up even the smallest hill and would slide right back down. Once finally up a hill, we'd slip, slide and ski our way down the other side. 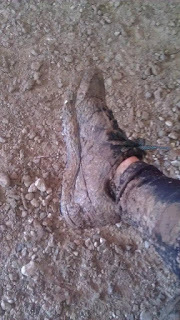 I fell numerous times but all were soft landings in the mud, thank goodness. We hit Stairway to Heaven one last time and barely ate or drank anything. It was time to be DONE. All I could think about was the hot potato soup and burgers at the finish line. We slid our way through mile after mile, alternating between quiet concentration and hysterical laughter over just about anything. We were bonking one minute, running with purpose the next, and sliding down hills laughing the next. It was crazy and I'll never forget it! Nancy was waiting at the finish for us and snapped some pictures. She had been done for almost 2 hours. (!!) David Hanenburg was also there to give us our wooden Cross Timbers finisher awards. So nice to see friendly faces at the end! 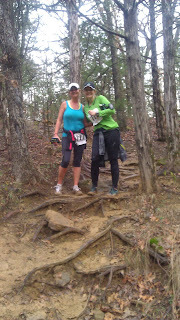 Kim and I had decided we didn't want to cross the line with excuses for our slow finish time..we wanted to play it up. So as we were approaching Kim was yelling to them how much fun she'd had and that she was coming back next year to run the 50 miler and I asked them if we'd won the race. :) It felt SO GOOD to be done. Nancy got busy bringing us steaming hot bowls of potato soup and then hot veggie burgers. Nothing has ever tasted as good as that potato soup tasted to me right then! 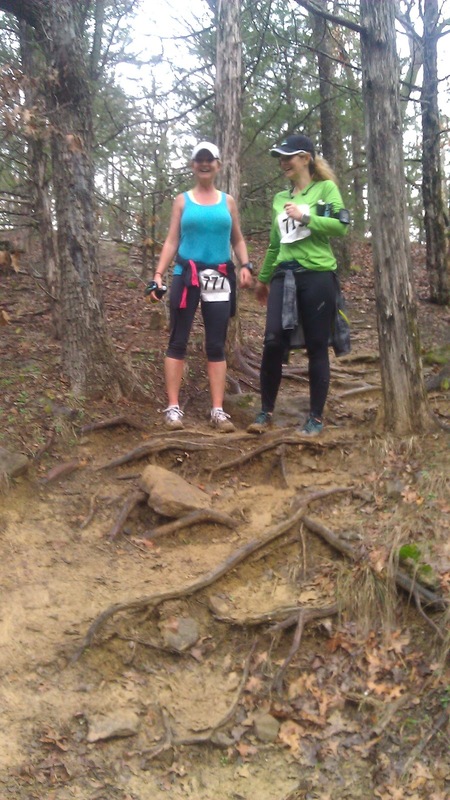 No matter what Cross Timbers throws at you as far as weather, Teresa and the volunteers step it up and take care of everyone and make it a great race. It's a beautiful and challenging course and I find myself back there every February. What a day!